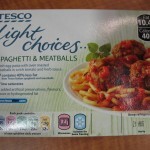 This is a pretty mainstream ready meal spaghetti and meatballs. The sauce is tomatoey and light but very heavy on the oregano. The six meatballs are dense, a bit gristly and flavorless with no discernible oven-roastedness. I would expect the roasting process to lend a brownish hue and Maillard tastiness to the meatballs but these are uniformly gray and bland. The pasta is soft and gummy. Why did they use egg spaghetti? That’s a strange choice to me, but I’ve noticed that egg pastas seem to be more commonly-used here than in the US. 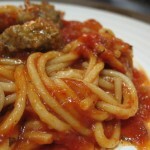 I prefer the texture of standard pasta to pasta all’uovo in most dishes. This one would’ve rated slightly higher with it.